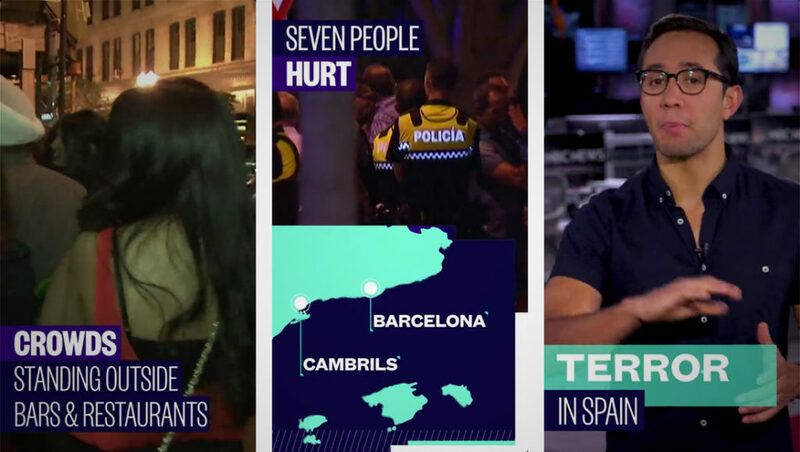 NBC News‘ Snapchat news show “Stay Tuned” has hit the 250 episode mark. Launched in July 2017, the show racked up 29 million viewers in its first month, according to NBC News, and continues to reach “tens of millions” of viewers each month, according to an NBC spokesperson. According to NBC, more than two-thirds of the audience is under the age of 25 and the “majority” of viewers watch the entire show. NBC did not provide more specific viewership data. The show debuted with a soft blue color scheme, which it used until mid-August 2017 before introducing a new logo design and color palette of teal, deep blue and red. Since its launch, hosts Savannah Sellers and Gadi Schwartz have interviewed Hillary Clinton, Joe Biden, Tarana Burke, creator of #MeToo, Miles Teller and Adam Schumann, and Olympian Gus Kenworthy and other figures in the news. The hosts have also gone into the field with their reporting, includingSchwartz’s visit to Casper, Wyoming to cover the eclipse and to Texas and Puerto Rico to cover the Hurricanes, and Sellers to South Dakota’s Pine Ridge Indian Reservation to report on what life is like for Native American teenagers.